You’ll notice that I’ve been gradually building up the power, as the insurance premium went down. 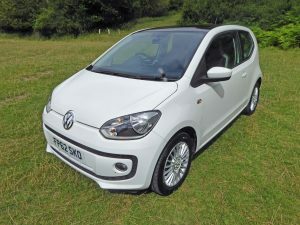 A white Volkswagen High Up, fitted with one of those black boxes to keep the speed down and the insurance down. Well, that’s the theory. If you drive the way that they want you to drive, the app says “Great driving” and you get a bit of a refund each month. No refunds came my way. Given that I’d signed up for an Audi apprenticeship, I needed to show some brand loyalty. 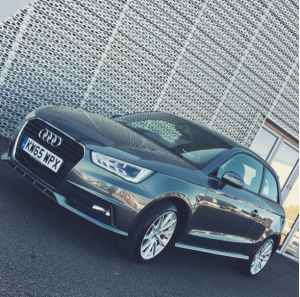 So, a good looking Daytona Grey Audi A1 1.4 TFSi S Line was the choice. Pretty nifty for a standard car, but it needed some enhancement. I couldn’t afford the insurance hike that would result from a power upgrade. So, it was all about looks…. steering wheel, gear lever, STX coilovers and a smart set of alloys. Plus a set of Yokohama Advan AD08Rs to add a bit of grip. 2.0 TFSi Quattro 227 bhp… Now we’re talking power. Working in an Audi dealership brings temptation. 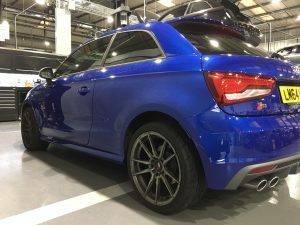 It arrived in the form of a Scuba Blue Audi S1… a bit more power than an A1 – 228 bhp , 0-60 in under 6 seconds. What’s not to like? The alloys came across from the A1, and a Quattro grill added a little more style. The downside… it’s a bit thirsty on the petrol.